After documenting how shoddily Liberty Mutual (LM) has treated injured victim Cheryl Harris, we found hundreds of scathing reports filed by persons covered by Liberty Mutual's home and auto insurance policies and victims of LM insureds across the nation. Report after report described the anger and frustration of Liberty Mutual policyholders and victims who feel they have been misled, lied to and defrauded. Policyholders describe Liberty Mutual as "crooks" and a "sham" and compare them to the "mafia." They say "Liberty Mutual should be investigated for insurance fraud, sued for illegal practices and that "The government needs to step in and shut these clowns down for good!" The information on this website should serve as a stern warning for everyone to avoid purchasing insurance coverage of any kind from Liberty Mutual! 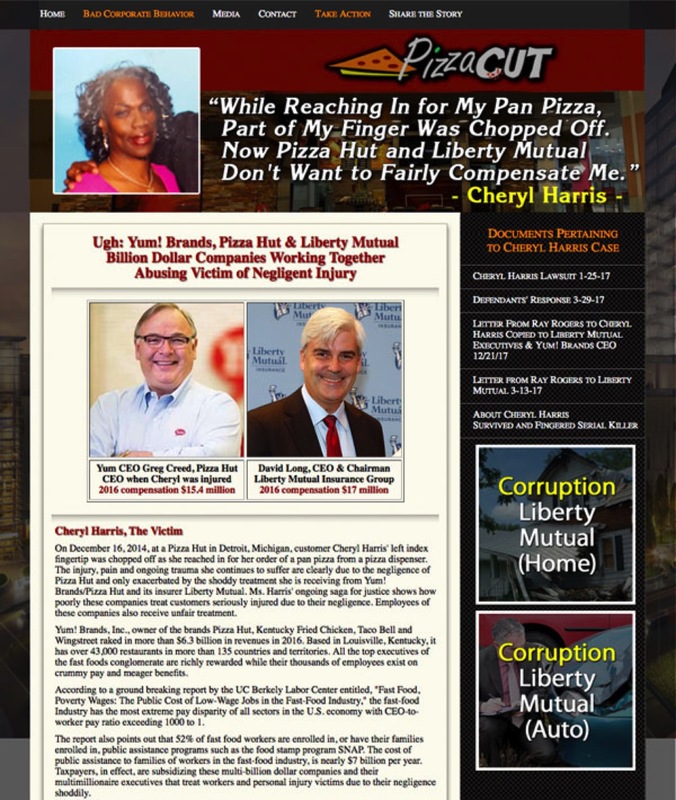 To learn more about our campaign to expose Liberty Mutual's deplorable behavior and to win justice for Cheryl Harris, please visit our website http://www.JusticeforCherylHarris.org. If you feel you are being defrauded or otherwise mistreated by Liberty Mutual please email us at info@CorporateCampaign.org or call us at 718-852-2808.